Adorable Designs: Adobe Fix – First look !! Adobe Fix – First look !! 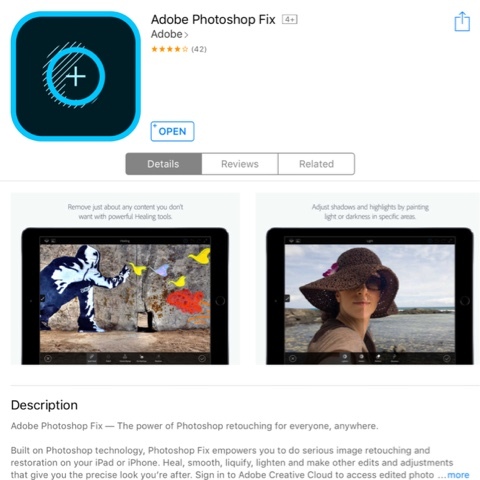 Adobe has come up with yet another iOS app for image retouching but for a change this time it is free to the users! The first version was introduced in the app store few days back (on Oct 4th 2015) and I am already falling in love with its functionality and ease of use. This app is packed with features which are useful for Instagrammers and Facebook addicts. Spot Heal: This is an amazing Photoshop feature which is now available in ipad and iphone through this app. Most of the candid mobile photographs will end up having unwanted objects and unknown person in the frame. Spot heal works like a magic to remove these blemishes. Liquify: If you are a Photoshop user, I am pretty sure you would have used this filter for creating crazy effects or for portrait photo retouching. This functionality in an ios app will open more doors to creative people ! Paint brush with blend option: Blend option is a boon when available in the brush tool. By adjusting the opacity the color from the brush blends brilliantly with the image. Start in app finish in desktop Photoshop: Another interesting feature in this app is that the images can be directly send to desktop Photoshop CC for further editing. On the first looks , this app looks promising. I strongly believe that I am gonna start using this more often. Sorry Android and windows phone users, as of now this app is available only in ios platform. What do you think about your State Flag Design ? adorebledesigns.info. Awesome Inc. theme. Powered by Blogger.